Random House Trade Paperbacks, 9780812976083, 224pp. This impassioned plea for radical and life-renewing change is today still considered a groundbreaking work in environmental studies. McKibben's argument that the survival of the globe is dependent on a fundamental, philosophical shift in the way we relate to nature is more relevant than ever. McKibben writes of our earth's environmental cataclysm, addressing such core issues as the greenhouse effect, acid rain, and the depletion of the ozone layer. His new introduction addresses some of the latest environmental issues that have risen during the 1990s. The book also includes an invaluable new appendix of facts and figures that surveys the progress of the environmental movement. 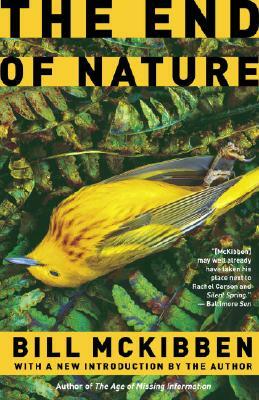 More than simply a handbook for survival or a doomsday catalog of scientific prediction, this classic, soulful lament on Nature is required reading for nature enthusiasts, activists, and concerned citizens alike. Bill McKibben has written several hundred pieces for The New Yorker. His writings on nature have also appeared in The New York Review of Books, The New York Times, Rolling Stone, and other national publications. He and his wife live in the Adirondack Mountains of New York.